Nintendo did something recently that they have never done before: they actually listened to fans and went back to change something that was wrong. Well, I suppose they have done this before in recent memory (see 3DS Slide Pad Pro). 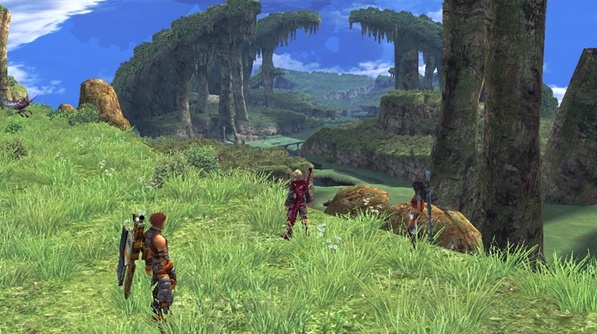 Xenoblade Chronicles, however, is just as important, and it doesn’t make your console look ridiculous. Xenoblade Chronicles is, in a nutshell, about machines that are terrorizing the last human settlements, and the only weapon that can cut through their rooting armer is the Monado, as sword that is said to be left from the titans. The titans, by the way, are two giants frozen in eternal battle above an endless ocean, and the game takes place eons after the battle on these giants. The world happens on top of their corpses. If you don’t thing that’s a cool setting, you are probably old or dead or both. So why do we need to pre-order? Well, to put it bluntly, Nintendo crapped the bed on this one. Thinking that no one in America would want to play this amazing game (92% at Metacritic, by the way), they didn’t have plans to localize the game. Finally, they relented a bit, and localized a full English version for PAL territories…but not NTSC; so even though an English version existed, they didn’t want America to have an actual, meaty RPG. Maybe because there was no waggling or Balance Board support or Mii avatars. Who knows. But they didn’t. But still, why pre-order? Even though we are getting the game here now, it won’t be readily available in stores. It can only be purchased online from Nintendo and Gamestop. The release date appears to be April second. That is about 58 days from now. So get to ordering. This game will probably go down as one of the best game Nintendo never wanted anyone to have. Speaking of listening to fans, Shigeru’s List is reporting that we, the raving masses, have a chance to vote via Facebook for the cover art for the game. There are four options available, and all of them look far better than any cover you would ever see on store shelves. Honestly I don’t really care about JRPGs that don’t have “Pokemon,” “Mario,” or “Earthbound” in the title, but yeah, this looks amazing. A game that takes place on top of two giant dead space monsters? Yeah, I’m in. I really can’t believe how excited I am for the game. It’s jumped up higher than any on my list for the first half of the year.